in the Spanish Revival Style. William Ford, Board Chairman and controlling stockholder of one the largest glass companies in the world, set his sights on the early California town of Ojai. After purchasing land on a majestic viewing knoll in Country Club Estates, he selected famed architect to the stars, Paul Revere Williams to design his Spanish-style center courtyard house and pool. Located on a small cul-de-sac street, adjacent to the world-class Ojai Valley Inn and Spa, this extremely private gated estate sits on 3 plus acres with mature oak trees and a working tangerine grove. The legendary Ford Estate is an extraordinary, finely detailed example of the noble Andalusian Hacienda-style built in the Spanish Colonial Revival style. The 16 room residence is irreplaceable, emphasizing the best in uncompromising architecture and design with the finest quality of construction and materials. A four-year monumental and historic restoration of the house, gardens and pool have recently been completed with the creative mastery of Kevin A. Clark that truly amplifies and enhances a grand, authentic lifestyle with state-of-the-art conveniences. Also referred to as La Collina Ranch, the estate was designated a Ventura County Cultural Heritage Landmark in 2010 with the Mills Act property tax advantage. This landmark estateʼs public rooms were designed for grand entertaining and large-scale family living with a generously proportioned reception gallery and living room, mahogany paneled library, stately dining room, butlerʼs pantry and breakfast room. The master suite is luxurious with a sitting room, dressing room with extensive built-ins, additional walk-in closet, two garden patios and tiled bathroom. The house features eight bedrooms, five full-bathrooms and three half-bathrooms. The estate is rich in historic detail that includes extraordinary wood ceilings, rare early California tile, period lighting fixtures, original hardware and five fireplaces. All rooms have spectacular pastoral and bucolic views. 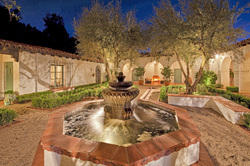 Reinforcing the strong cross-axial organization, connecting inside with outside, this romantic Hacienda is designed around a large enclosed center courtyard, representing the glamour of the Spanish revival era. Most rooms are organized to have access, either directly or visually, to this impressive center garden. Paramount to the courtyard design is a large tiered fountain, which spills over into a rivulet leading to a small in-ground fountain. The meticulously landscaped grounds with spectacular Ojai vista views are complete with a swimming pool, fountains, formal rose garden, exterior loggias and numerous terraces and patios. These outdoor spaces were designed for intimate or grand scale entertaining, used as focal points and destinations that extend the public rooms and interior circulation of the house. This Paul Williams trophy estate property has an unparalleled history and architecture, exceptional location and embodies true Southern California indoor/outdoor lifestyle at its best.